I was baptised and raised Protestant and have always been puzzled by and admired Catholic devotion to the Blessed Virgin. During my spiritual journey I have always been drawn more towards the old pagan goddesses and archetypes of the feminine divine, who seemed to have more depth than merely praising the Catholic virtues of "immaculate virginity" or "divine motherhood" and the Neopagan analog of "Maiden, Mother, and Crone" that always felt way too patriachic to me. It was the outstanding book "The Black Virgin" by Jean Hani that blew my mind, explained and "jailbroke" the "Marian Mysteries" for me. After I had finished it I finally understood the underlying forces of this archetype and immediately felt an urge to connect to her, the "Primordial Mother", the "Shekhinah", "Shakti", "Magna Mater", the "Yin" in the cosmic duality of "Yin and Yang" in her Christian form as Blessed Virgin Maria. Through my life-long connection to the magic of the Canary Islands I eventually found a form of her that I could very much relate to and connect with and I am happy I got to meet her "in person" on a vacation I did this year. 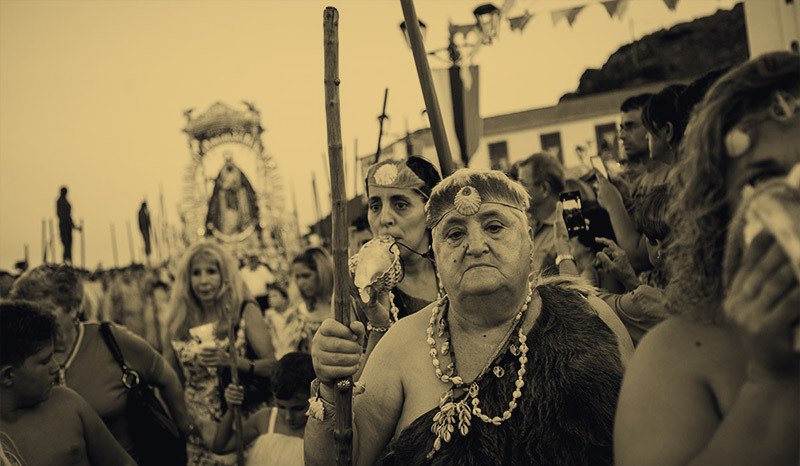 This article is about the patron saint of the Canary Islands, the Virgen de la Candelaria and how she is a syncretized form of an older Guanche goddess called Chaxiraxi. For better contextual understanding and my interest in her form of the Blessed Virgin Mary, please check my other article. "ch" (t͡ʃ) pronounced like the "ch" in "leach"
"sh" (ʃ) pronounced like the "sh" in "sheep"
"gh" (ɣ) is a bit more difficult as it does not exist in English and it is pronounced like the "g" in the Spanish word "amigo" or the Portugese word "agora" or the German word "damalige" or the "γ" in the Greek word "γάλα". 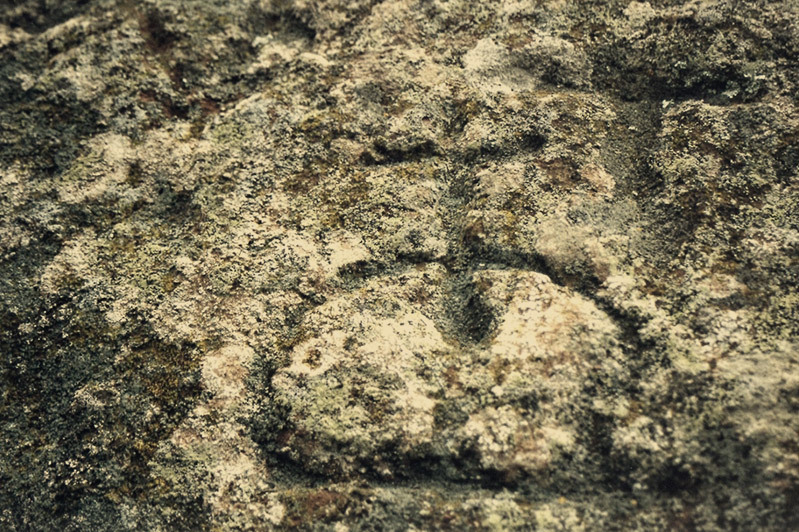 In Spanish representations of Guanche language it was usually written as an "x". Once upon a time, long before the Canary Islands were even known to the Christian world (approximately during the 14th century) two Guanche herdsmen pasturing their flocks had to cross a sandy beach going towards a ravine when suddenly their sheep were frightened and turned back. One of the shepherds went forward to see what had frightened the flock and saw a dark figure standing on a rock, holding an infant. He took a stone and raised his arm threatening that he would throw it. At that moment he was paralyzed and stiff and could not move his arm anymore. The shepherds were puzzled about this and came close to the figure, a statue of a woman holding a baby. Still unsure whether it was alive or not one of them tried to cut one of the statue's fingers with a sharp tool and miraculously only found himself cutting his own until he was bleeding. The two herdsmen went straight to their Mencey (king) to report what had happened and he was so curious about this, that he ordered them to go and bring this figure to him. When they carried the statue back to him their stiff arm and cut finger were suddently healed. The Mencey and his followers concluded that this visitor must be something supernatural or divine and the statue was put into the Mencey's cave palace at Chinguaro. Decades later when some of the islands were already in Spanish hands, the Mencey of Güímar learned from a baptized Guanche who came from Mahorata (Fuerteventura) who the depicted lady was. Not knowing anything about Christian faith they still understood the identity of the icon and called her "atch mayes wayya ghi raghi āhghuran ashshaman" - "the mother of him, the spirit that is sustenance of the universe. Sparkling one. Heavenly one." - short "Chaghiraghi" (Spanish: "Chaxiraxi"). The statue was moved from the Mencey's cave to Achbinico, a lava cave right next to the sea. From the reports about this legends from later missionaries and Spanish historians it usually seems that the Guanches had picked up veneration of the Virgin Mary as something completely new that would replace their pagan beliefs, and that the Achbinico cave was established for this spiritual purpose. But according to carbon-14 dating of ashes found in the cave it had been used for ritual purposes for already at least 3,000 years and had a sacred eternal fire like the Vesta in Rome. A stone stele known as "Stone of Taganana" was found in a different village on Tenerife that featured engravings of symbols, and most prominently the symbolic representation of the Catharginian goddess Tanit. So it is obvious to assume that the Guanches already had a concept of a primordial mother goddess they called "Chaghiraghi" and saw in the found statue of the Blessed Virgin Mary a fitting representation of an already venerated female divine principle. This goddess even had a herd of over six hundred goats under her protection who had their own grazing land forbidden to be trespassed by anyone and rams from that herd were used as sacrifice - something that resonates with ancient Phoenician cults, but also with the mediterranean goddess Artemis, to whom goats were sacred before the bear became important in more Northern areas (6). A number of names and by-names of Artemis/Astarte has an uncanny overlap with personal names (Artemi, Artendeyfa) and locatives (Artejeita, Artagayda, Aritarime, Artaos, Artenara) on the Canary Islands, as well as the royal title Guanarteme (guan arteme = "Man of Artemis") which Menceys of Gran Canaria carried (6). All evidence that the mother goddess was present for millennia on the Canaries before she took the form of La Morenita. 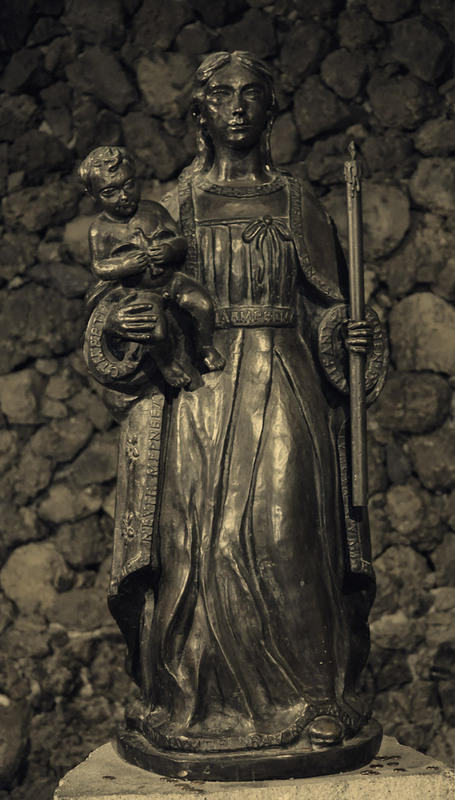 The statue of the Blessed Virgin Mary became known as the "Lady of Candelaria" and she became and remained until today a strongly venerated patron saint of the Canary Islands. She is one of the enigmatic "Black Madonnas" also found all across Europe, built from a dark, almost black wood, and thus her nickname among the Spanish until today is "La Morenita" ("the little brown one"). Translation: The Father protected by the Virgin Mary. Translation: Be gracious in the victory Lord of the original eternal light. Translation: Oh, your find increases the protection against superstition! Pronounciation: Ul-m yən ǎr anfər Iaeb ənubi f-m ǎr fwen. Nwi-ina bib am əliffi n wibbib. Ni bi-an. Translation: Your heart, the place of the treasure more important, Yahweh child over you, luminous treasure. A weight in our consciousness is like a pile that is carried on our backs. Dominate that load. Pronounciation: Ffu b-mirna. Ǝnubi am ti ewen am bir ur wiwi-n rn, abu i məfri. Bib-wən əyyan nut ərɣun. Translation: Dawn, great power. The child, like the father and the path of perfection, avoid illness, they are a balm for the person who suffers. Your only weight must be a bright candle. Translation: We welcome the ignorant pagan. We will forgive the offense that is fear of the Sublime. The Lord of the islands of Fuerteventura and Lanzarote, Sancho de Herrera, heard of the legendary Virgen de la Candelaria and he wanted to possess her and was convinced that she should belong to the Christians who understood how to appreciate and venerate her, while the Guanches, being a people without God, did not possess that knowledge. The Mencey of Güímar denied his request of transferring the statue to his island, so Sancho de Herrera plotted a kidnapping. 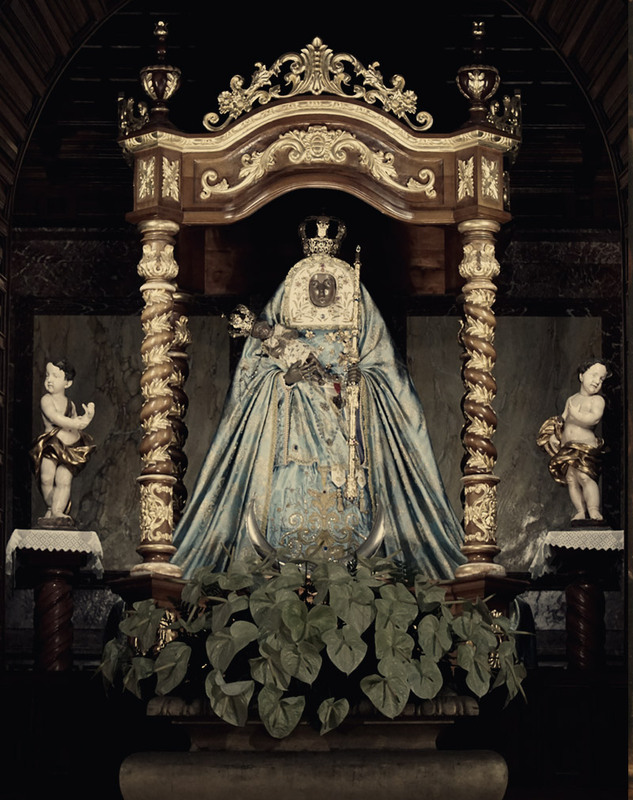 The seizure was successful and La Morenita found a new home in the church of San Salvador on Lanzarote where she was venerated with great joy and devotion. But Lady Morenita did not like it. Sancho de Herrera decided to bring La Candelaria back to her original cave, but when he arrived there nobody believed him that the statue had been stolen, because she had been seen by the locals in her usual spot all the time - to them she had never been absent! Decades later, after all of the Canary Islands and their autochtonous inhabitants had been brutally murdered, raped and forced into submission and conversion to the Christian faith by the Spanish overlords, the Lady of Candelaria was moved into a larger home a stone-throw away from her cave, the Basilica de la Virgen de Candelaria that better suited the growing number of pilgrims and which featured more pomp that seemed more appropriate to the new servants of La Morenita. A small chapel was built in front of the Achbinico cave entrance and dedicated to Saint Blas. The Black Lady seemed to not really have liked her new home. She had to bear with it for a few centuries, but in the year 1826 a big storm hit Tenerife that created such rivers of water coming down from the mountains that it flooded the Basilica and washed the statue of the Lady of Candelaria into the sea. Back to where she had risen from five hundred years before. The Basilica was rebuilt and a new statue was made to replace the lost icon. A bronze copy of the original icon of la Morenita was made and put in her old spot in the Achbinico cave as a memorial. It is a quite strong image, because the bronze is all black and her famous gaze has been replicated in an uncanny way it gave me chills when I saw it. The rebirth did not lessen the passionate devotion she enjoys up until today, not only on the Canaries, but across the world, especially in the Americas and the Philippines, to which Canarian migrants had taken their cult along with them. In the Cathedral of San Fernando of Texas, USA is a replica of the Virgin of Candelaria, which is accurate to the venerated in the Canary Islands. This is because the city of San Antonio was founded by Canarians. She is widely venerated in South America and the Caribbean, Bolivia, Medellín, Puerto Rico, and she is the patroness of Western Visayas and Negros Occidental in the Philippines. In Cuban Santería, the Virgin of Candelaria is identified with Oyá as well as Oba. In Brazilian Candomblé, the Virgin of Candelaria is identified with Oshun. For the indigenous people in the Andes, she is identified with the Pachamama. The Catholic Feast Day of La Candelaria is on Candlemas (February 2nd) and on the Canary Islands she is celebrated mainly on August 15th. 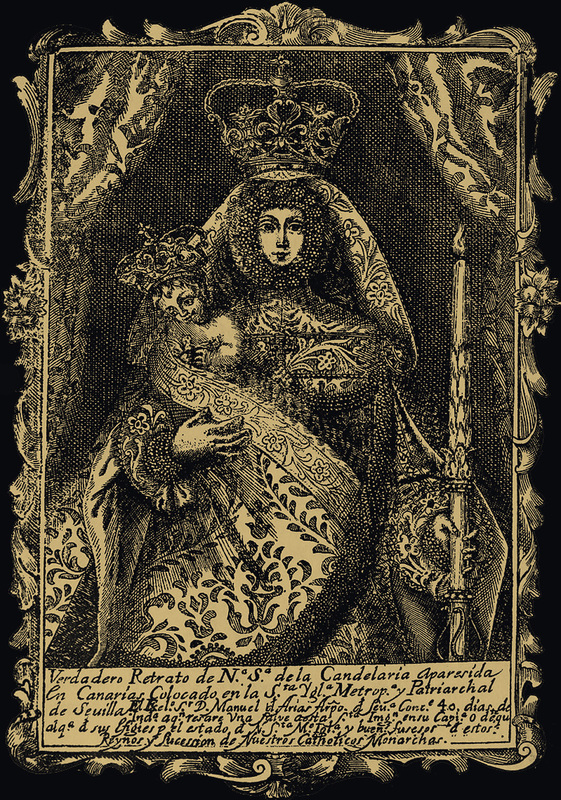 Today it is taken for granted that the original image of La Candelaria with the amazigh inscriptions on her drapery was left on the beach in Tenerife on purpose by very early missionary friars of the Islands of Lanzarote and Fuerteventura. And for their planned mission to fully unfold, they used the aforementioned Guanche that had been captured before, then "Christianized", and finally returned to their land to tell his people about the Virgin Mary: the one today known as Anton the Guanche Monk. 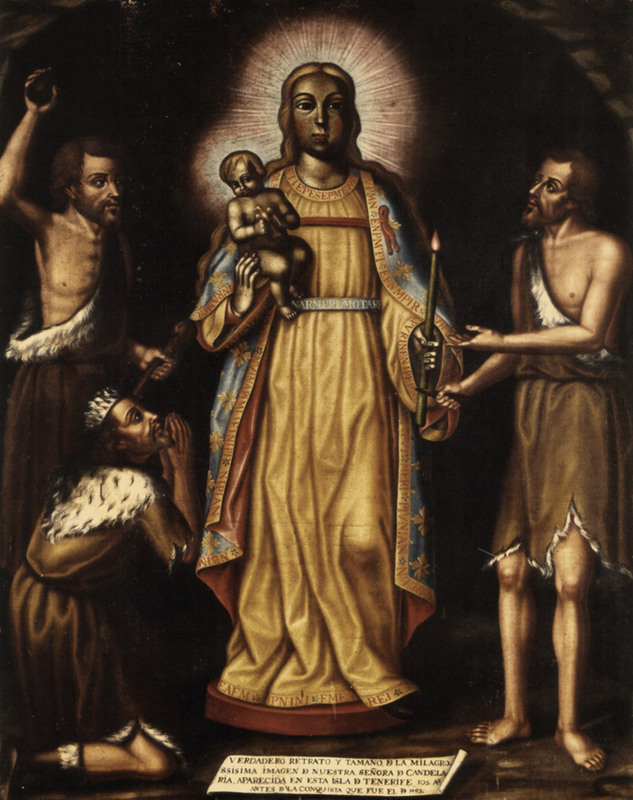 Depending on who you ask, their conspiracy was a success and turned the heathens into devote followers of the BVM, or it failed because the inhabitants of Tenerife simply continued their already ancient cult of Chaghiraghi now disguised under the embroidered mantle of the Virgin of Candelaria. In the end it does not matter, because from the spirits perspective the Primordial Mother prevailed, flourished and spread across the globe. Aside of inhaling the island's omnipresent magic on every step I took on our vacation on Tenerife, through the lava deserts, pine and laurel forests and black beaches, I had some rituals planned to connect to the local spirits and Queen Chaghiraghi herself. I prayed the novena to la Morenita for nine days in a row and visited her on the last day to give praise and do the last prayer in front of her. It was a quite touching moment. I did some research about fragments from the Guanche language and found some that can be used as "barbarous words". I added them to known prayers to the Virgin de Candelaria, which you can find below. To stick with the strictly Catholic originals, just omit the Guanche parts. Oh, atch mayes wayya ghi raghi ahghuran ashshaman (a), Oh Lady of Candles, Oh Great Mother, blessed above all creatures, I pray that your soul is now with me as I give tribute of my worship to the Creator. Virgen de la Candelaria, we come to you with the trust and simplicity of children. We arrived with our anxieties and hopes, our joys and sorrows, with the fatigue of work and the weight of our sins; with all that we are and have. Virgen de la Candelaria, You are the first carrier of Light, which is Christ; You are our Mother; You wrangling us with Christ the Saviour; You are our hope, comfort and joy; You accompany us in the city, the desert, the valleys, the mines, and the sea; You are our star on the way to the Father; You are our footpath to meet Jesus. Virgen de la Candelaria, Virgin Mother of God, hear our prayers, bless our homes, obtain for work and health; teach us to hear the word of your Son and to live it every day, obedient to the Holy Spirit. We know to build a nation of brotherhood in our Church and in our land. Amen. for I need your watchful care. reward me for my successes. please obtain for me this favor… (silently mention your petition here). to be what Jesus wants me to be. I am His; I am yours, my good Mother. Amen. (a) the mother of him, the spirit that is sustenance of the universe. Sparkling one. Heavenly one. Oh Tanit, white deity, goodness fecund, oh mirror of purity, send in severity your beams on the world. Your radiant chariot is in horror of sombre night. So mysterious monsters, as soon as you appear, return to the desolate gloom. How lightly you slip through the clouds moist and clear. The golden stars in the firmament. like a flock gently go where you guide them. You reign on the ocean where the wave mounts on high; fill the air with thy splendor, carpeting earth with flowers, at the bottom of the sea the pearl. The crowd madly in love follows thee, enchantress. You take them in your course, changing as you do every day, only more youthful tomorrow. Oh, Tanit, white goddess, goodness fecund, oh, mirror of purity, send in severity your beams on the world. Novenas are prayed on nine days in a row, optimal is the same hour of the day on each of the nine days. Start each with the Opening Prayer followed by the day's prayer and finish with the Closing Prayer. Dear Virgen de la Candelaria: we gather together with you. We bring our devotion and our love. Accept it, our Mother. Let us contemplate your virtues and teach us to imitate them. May we resemble you more each day, to please the Lord as you did and live like this, in peace and joy and then come to share with you the eternal bliss of glory. Amen. Immaculate Lady of Candelaria: you who being pure in the sight of God, were yet willing to be purified like a sinner to teach us the importance of living in God's grace, grant that we, in imitation of you, seek to give due importance to being purified in the eyes of God, even though we should humble ourselves to recognize our sins in confession. Amen. Immaculate Lady of Candelaria, who, being full of holiness have nevertheless presented yourself at the temple to fulfill the Law of God, grant that we, in imitation of you, come to love our church and consider it more each day as a place to approach God. Amen. Immaculate Lady of Candelaria: you who did not hesitate to put your son Jesus into the hands of Simeon, knowing how he prayed in the temple for the grace of seeing the Redeemer grant that we too may sigh to have Christ in our heart so that you may hand it to God. Amen. Immaculate Lady of Candelaria: You who upon presenting your son Jesus in the temple heard the announcement of your pain and accepted it as the will of God, grant, that we shall not become that prophesied sword and our sins the cause of your pain. Amen. Immaculate Lady of Candelaria, You who neither upon presenting yourself in the temple nor at any time thereafter invoked your condition as Mother of God, demonstrating the importance and value of humility, let us put aside everlasting self-concern and based on your example may we grow in appreciation of humility. Amen. Oh Blessed Lady of Candelaria: we pray that you obtain for us from your beloved Son Our Lord Jesus Christ the grace to imitate your virtues, keep the commandments and be repelled by the horror of mortal sin. So one day we will rejoice eternally in heaven. Amen. Immaculate Lady of Candelaria: aware of our weaknesses, we come to you, so that you may obtain for us the grace of our Lord Jesus Christ, to be able to lead a life worthy of our Christian vocation, to imitate your virtues and thus obtain the reward of eternal life. Amen. Immaculate Lady of Candelaria, through your virginal purity, your immaculate conception and your prerogative as Mother of God, obtain for me from your beloved son, humility, serenity, purity of heart, body and spirit, holy perseverance in what is good, the gift of prayer, a holy life and glorious eternity. Amen. Immaculate Lady of Candelaria; by your obedience to the Father, aware of our pride and arrogance, we beseech you to assist us to accept the will of God, so that our whole life may become a renewed Yes to the will of the Eternal Father. Amen. We thank you, our Mother and Lady. We are your children and we put ourselves in your hands, so that you educate us and make us true children of God, holy and joyful Christians. Amen. Glory to the Father and the Son and the Holy Spirit. As it was in the beginning, now and forever and ever. Amen. A suitable incense for all invocations would be an ancient Guanche mix of Canarian herbs, which you can find in my other article, or dried "smudge-sticks" of Artemisia thuscula, or simply frankincense. Here is a beautiful poetic piece I found on the website of the Order of the Black Madonna about the spirit of the Lady of Candelaria that I resonate well with. (1) Hani, Jean. "La Vierge noire et le mystère marial". Trédaniel, 1995. / "The Black Virgin - A Marian Mystery". Sophia Perennis, 2008. (3) Reyes García, Ignacio. "La madre del cielo. Estudio de filología ínsuloamazighe." (2007). (4) White, Gordon. Star.Ships: A Prehistory of the Spirits. Scarlet Imprint / Bibliothèque Rouge. Kindle Edition. (5) The Hymns of Orpheus. Translated by Taylor, Thomas (1792). University of Pennsylvania Press, 1999.